What do antique finds and beautiful rugs have in common? You’ll find them both in the charming home of Mary Alice at Chateau Chic. Mary Alice’s decor has an understated elegance that’s quite appealing. 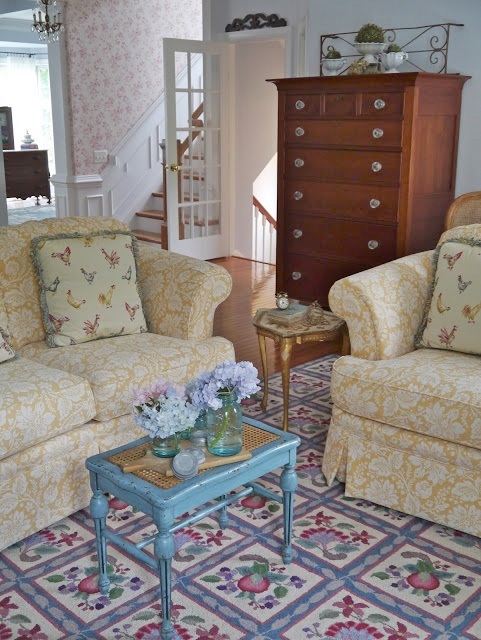 Mary Alice has a flair for mixing pretty patterns like you see here in the family room. She also has a knack for choosing beautiful rugs, which you’ll see throughout her home. I love her choice of subtle colors. Everything just blends so well. From the family room, you can see into the pretty white kitchen. Victorian style molding and a stained glass window enhance the view. Pretty Victorian molding also graces the window above the sink in the kitchen. And oh those bread boards!! I would love to have them all. A charming rug with little houses provides soft comfort underfoot while cooking. Mary Alice’s dining room always takes my breath away. 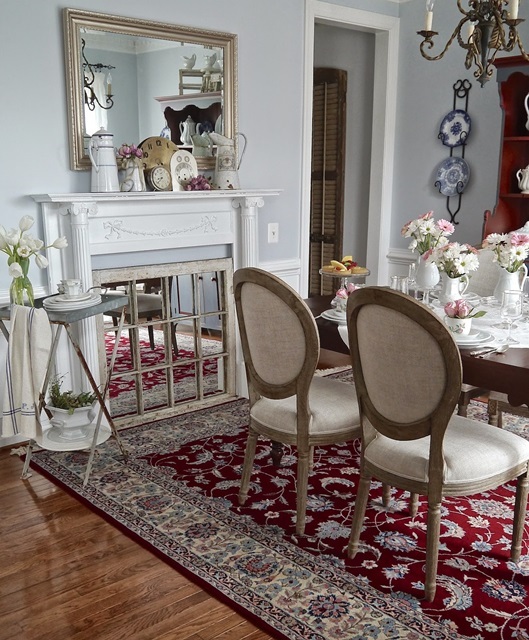 Another gorgeous rug anchors her dining table and French style chairs. Pretty floral arrangements lend a feminine touch in the room. 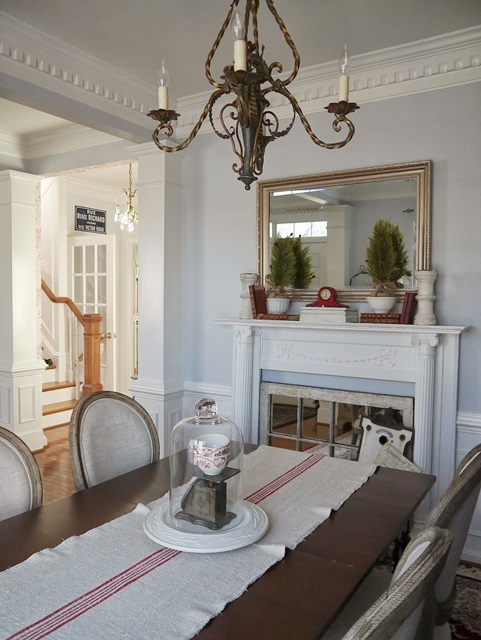 like the dental molding near the ceiling and architectural trim below the chair rail. She has multiple mantels in her home as well. And did you notice the chandelier? 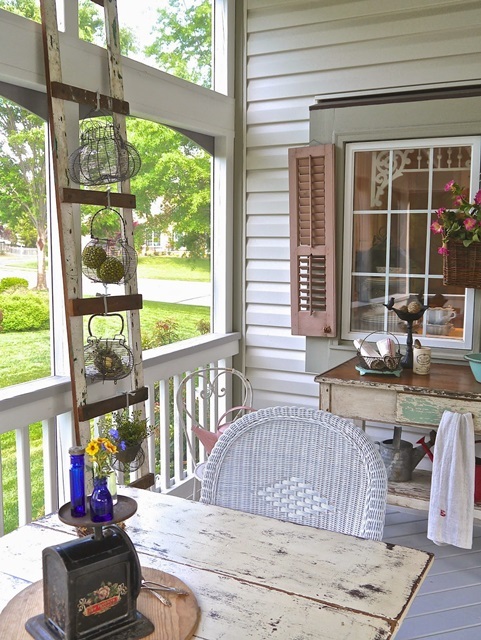 Out on the screened porch, Mary Alice has created an inviting retreat. A variety of vintage finds intermingle with worn wood pieces. The wire baskets and pink shutters on the window add a bit of charming whimsy. Flowered retro tumblers add fun color that matches the pillow in the background. Everything is beautifully combined to make appealing vignettes! 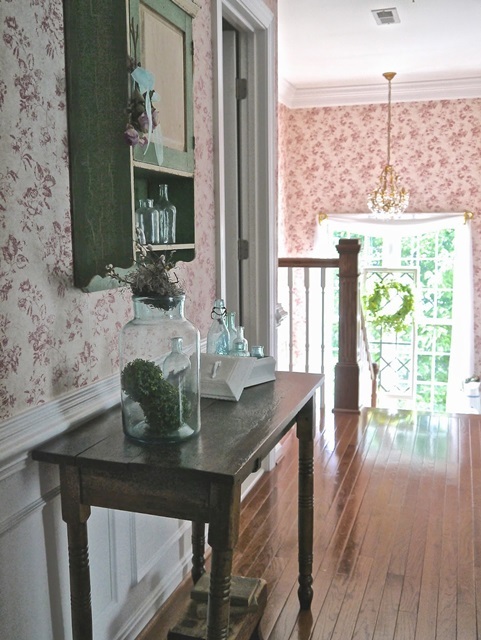 The upstairs hall wears beautiful wood floors and pretty wallpaper. 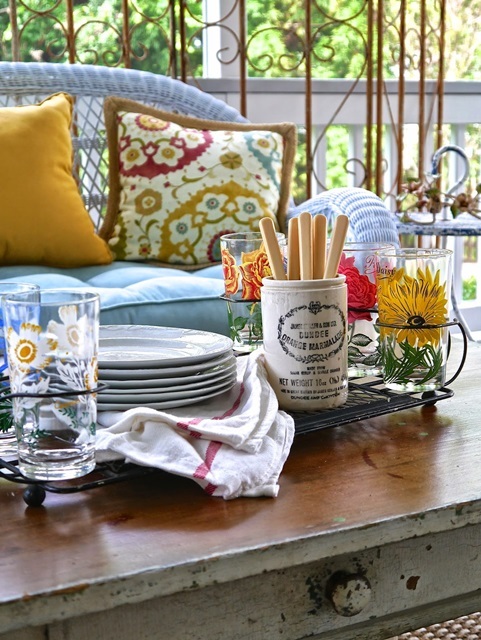 Mary Alice has artfully arranged vintage bottles on the little farmhouse table. It’s these attention to details that make a house a home. 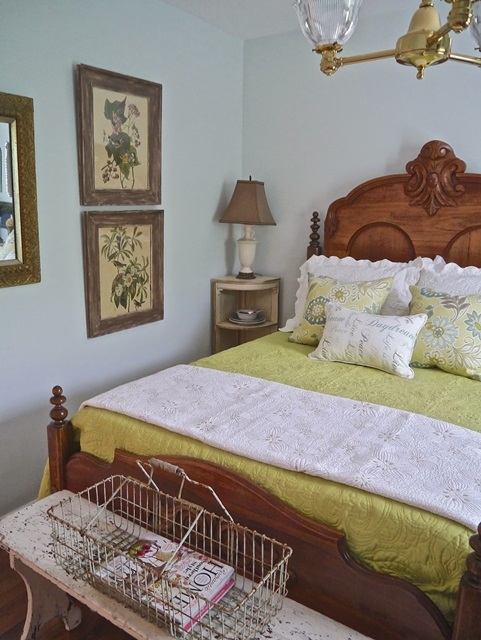 A beautiful antique bed takes center stage in the guest room. I love the soft color combination in this room. Finally, a peek into Mary Alice’s master bedroom complete with a beautiful rug. More soft colors and pretty patterns adorn the bed in the form of pillows and a throw. I hope you enjoy Mary Alice’s charming home as much as I do. 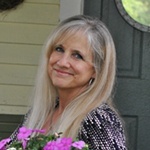 Be sure to pay her a visit at Chateau Chic for more loveliness and inspiration! 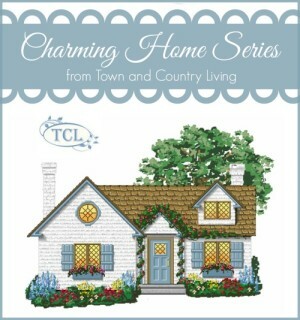 See more beautiful homes in my Charming Home Series! What a very lovely post you put together to feature my home. Thank you so much for the privilege of being part of this series! Mary Alice, thanks for opening your home to all of us!! 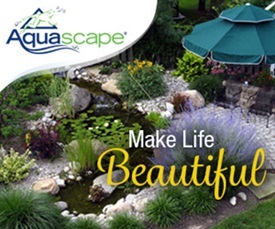 It was a pleasure and an honor to feature your beautiful home here today! 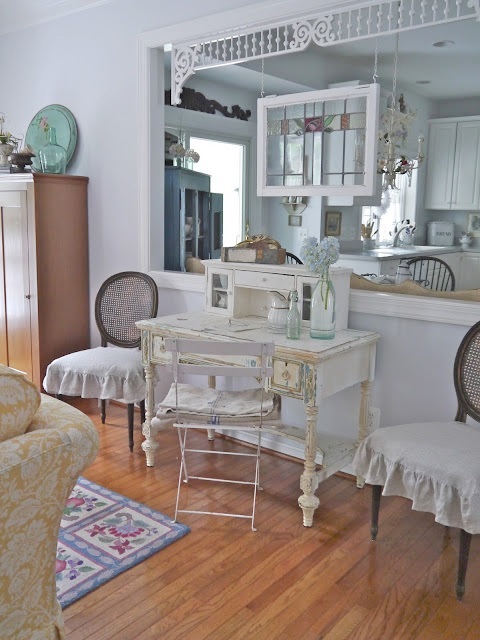 Mary Alice has a beautiful home filled with so many pretty things…I love her style and the way she displays everything!! Loved the tour! 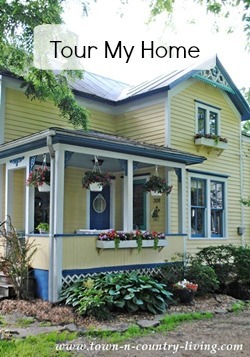 I love Mary Alice’s House and her blog! Great choice this week Jennifer. I love Mary Alice and her beautiful home. Love that she finds love in so many unique pieces in her home. Love her bedrooms. 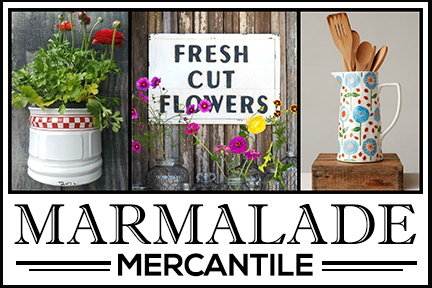 I just love Mary Alice’s home and blog!! She really has a great eye! I adore all the architectural details and the romantic feel she creates in her home! So pretty! 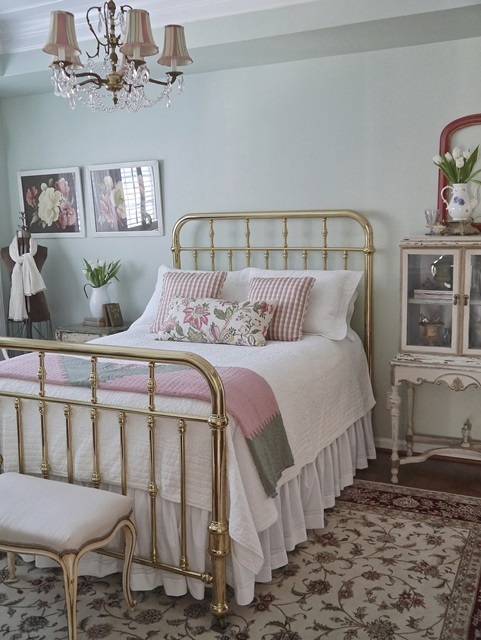 Mary Alice’s home is just lovely and it was fun to see so many rooms all in one post. Thanks for taking us along on the tour, Jennifer! Oh I love everything she does!! Her home is so beautiful and fresh but not trendy. Love it all. I have had the wonderful pleasure of being in Mary Alice’s incredible home….you can actually spend all day viewing the gorgeous details and fabulous vignettes throughout the house…Mary Alice has a talent for finding the perfect items for her home . . . this is just a smidgen of the beauty of this house…you described it well, a charming understated elegant beauty! I love Mary Alice’s vignettes. She’s got such cool stuff and knows what to do with it! Mary Alice has a very charming home, Jennifer! I love the area rugs she has used throughout her home. I think I was more excited about our putting in hardwood floors because I would get to choose a few area rugs to use over them. : ) Love her kitchen and her screened porch is a favorite. I enjoyed this tour of Mary Alice’s home. 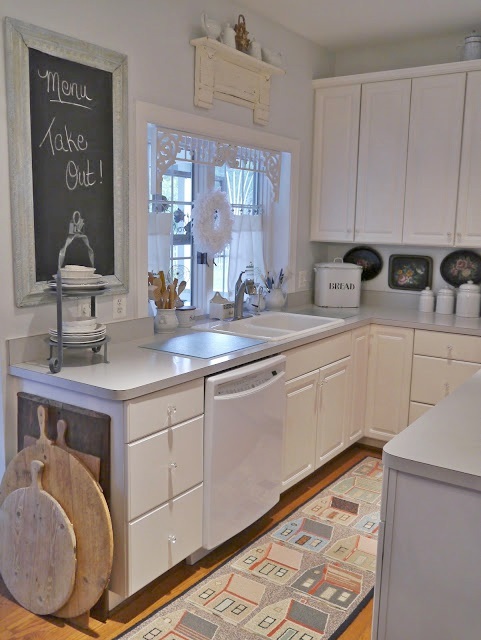 I follow her blog and always enjoy seeing her latest decorating projects and antique purchases. Would love the opportunity to shop her house! You havé created a post of wonderment here with the tour of our Mary Alice. I adore her home for so many romantic reasons, and yes her mix of French country is the best nothing in a room has to compete for attention, it’s so perfectly placed where each piece stands out and has there own voice. I adore her porch, can you imagine walking up to her porch to take a closer look and then To get invited in. It’s as if her home is a country fFrench Inn. Thank you for feta touring her home, it gave us all a chance to see each room as if we are her personal guest…Mary Alice’s home is so inviting it, invites all to fall in love with it. I also hope to see you visit me and my French home. Hi Jennifer, Thank you for the tour of Mary Alice’s gorgeous home. She is beyond talented with her displays and color combinations. She is an inspiration to all. I love every room and too many favorites to pick just one area! I have to go back and view each photo again. Mary Alice is a favorite of mine. She has such a beautiful and warm home. I love her style and creativity with using French objects a true inspiration! I am so happy you featured her home. I’m a long time follower of Mary Alice and I just love her style. She always inspires. I love Mary Alice! This was so much fun looking at all of her pretty rooms again! She’s so talented and I’ve learned so much from following her blog. And she’s so sweet! I’m so glad to see her featured here! DItto. Mary Alice ROCKS! She does the best vignettes, and finds the coolest stuff!